We're TAKING DECEMBER BACK... again! If you'd like to prevent holiday mayhem by making unique and inspiring Christmas cards, in the company of friends, January through November... Why not join us? 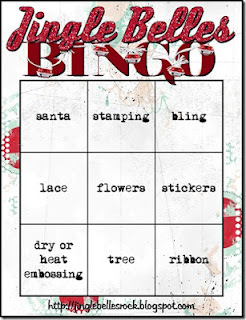 We're still playing Jingle Belles BINGO this week ... have you made a bingo yet? If not, you still have until Wednesday, September 5th at 6pm EST to join our fun & games. Lauren says, "i chose the bottom row for my 'BINGO', so i pressure embossed snowflakes on my label shape, as well as my die cut tree, and added in some vintage velvet ribbon i scored on a recent thrifting expedition; it was only after i finished the card that i realized i had a double bingo via the middle vertical column, since my letters and label shape have subtle text stamped on them, i've used a large dimensional rose, and of course the tree is still there! 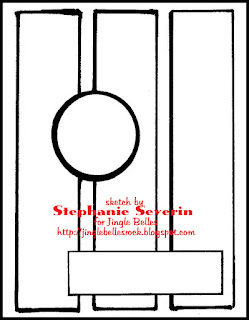 :) i was further inspired by the 'summer cottage' theme at the shabby tea room' and by the current retrosketch (#26)." (hey if it works for you, I say go for it). starting my tree from the bottom and layering upwards. white glittery star with white pearl *lights* to decorate my tree. The sentiment is from Hero Arts Joy To All." Scroll down to the original post for full details and the linking tool! 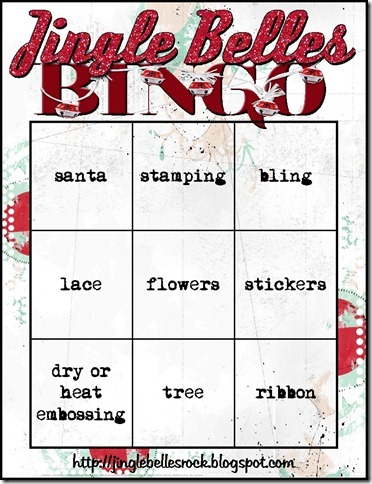 Since we're full of fun & games at Jingle Belles, we decided to create our own Jingle Belles B-I-N-G-O card for this week's prompt. 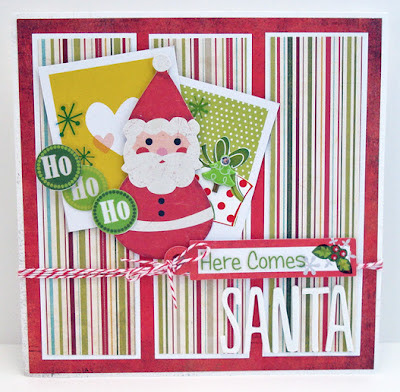 All you have to do is create a card using all three of the elements from a single row (horizontal, vertical or diagonal ... so you have lots of possibilities). Here's how we scored a BINGO this week. 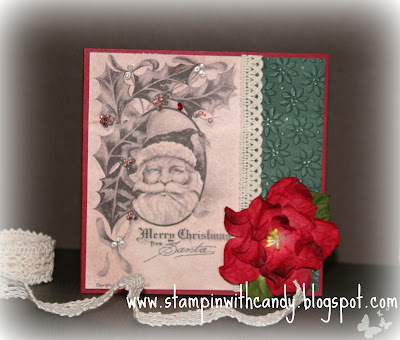 Stephanie says, "I went with a vertical bingo right down the center - stamping, tree & flowers. I die cut my Memory Box Flowering Christmas Tree from shimmery aqua cardstock, adding white pearls to decorate the blooms. The stamping is Hero Arts Grid Pattern for a tone-on-tone krafty background with a darker brown stamped sentiment from CatsLife Press." 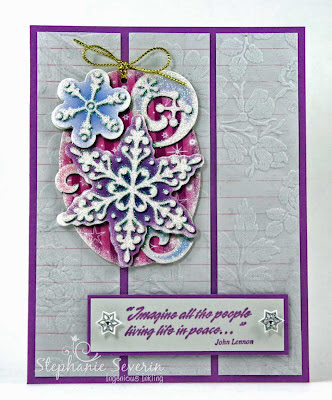 Lauren says, "i chose the diagonal that starts at the top right corner, which got me bling, flowers, and embossing; the last is difficult to see in the photo, but quite cool in real life: i used one of cuttlebug's thin strip embossing folders to add texture to my pink and white cardstock snowflake border strip! 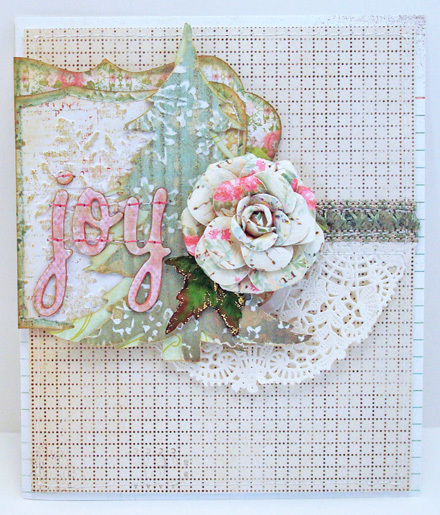 having taken inspiration from shabby tearoom week #128: "shabby patterns", and designed my layout around unscripted sketch #172 this card pretty much made itself! gotta love that, right?!" So try your luck at Jingle Belles B-I-N-G-O this week ... whatever combination you choose, you're sure to win with a fabulous holiday design. 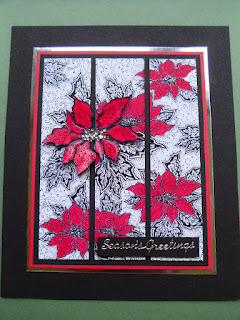 Remember to link-up your card by 6pm EST on Wednesday, September 5th ... and if you upload to galleries or our Flickr Group, use keyword JB-12-18. stretched the sketch to fit her fabulous long-and-narrow card design, and then dressed it up in rich hues and bold patterns! 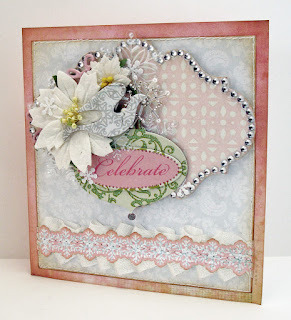 saw the sketch within this beautiful and ornate over-sized rubber stamp, and used dimension, gems, and a bit of sparkle to emphasize the "main" flower! 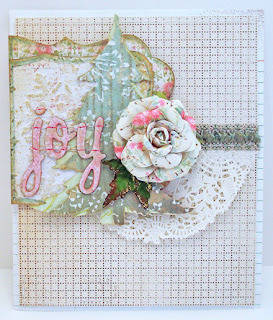 stamped the sketch components simply but perfectly-- in several colorways-- then added just enough embellishment to enhance her composition! 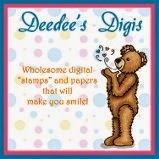 miss carla, please email your address to jinglebellesrock @ hotmail [dot] com so we can get your prize out to you ASAP! 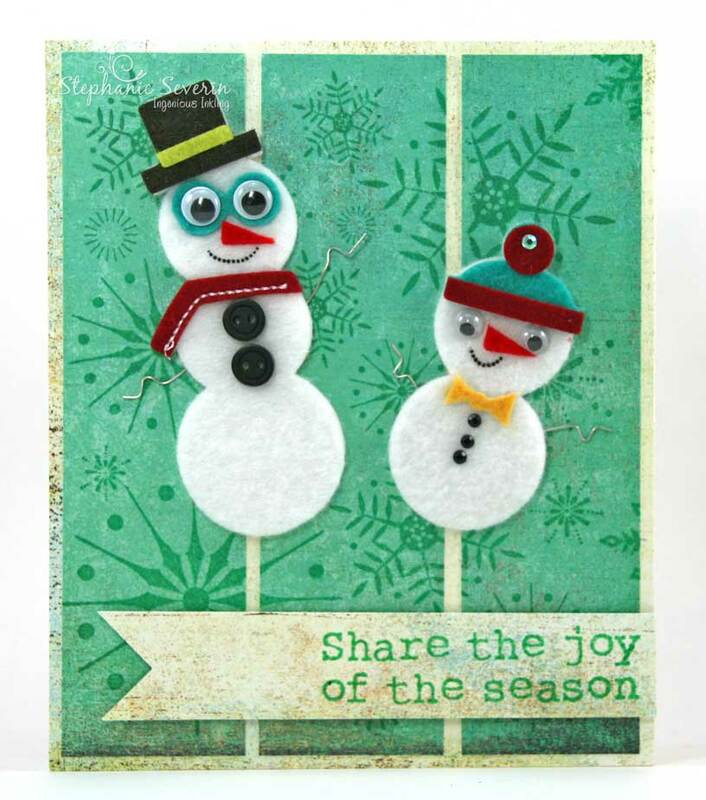 Stephanie says, "I broke out my favorite felt snowmen stickers from Basic Grey's Jovial Collection together with some Hero Arts stamps ... those little guys certainly look like they will be sharing some joy when they arrive in the mail." 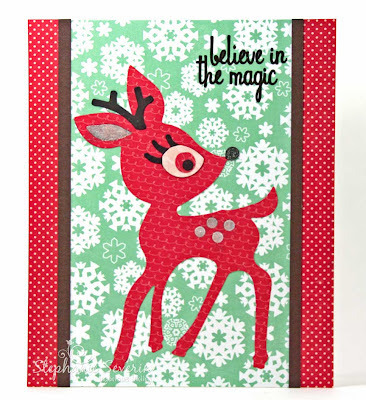 Lauren says, "i was inspired by the august color challenge at EAD designs to make my card red, green and yellow; and used quite a few of their small but adorable funky christmas tag stickerz in my card. i thought it might be difficult to work in that bright sunshiney shade, but found that this stripey echo park christmas paper had some, as did the fun faux polaroids from my favorite sheet of dear lizzy neapolitan... and everything else just sort of fell into place!" 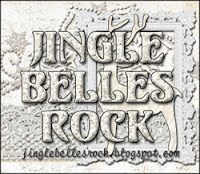 for this prompt, ♥JINGLE BELLES♥ we're getting sketchy again! we're pleased and proud to announce that stephanie has created her first-ever sketch for our little blog, and since it's really rather fabulous let's get right to it, shall we?! 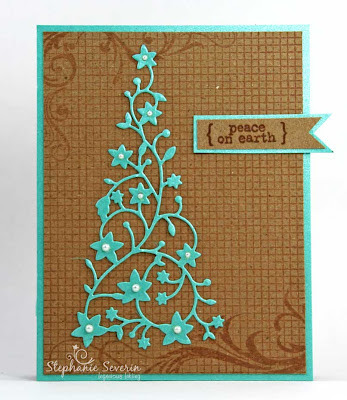 Stephanie says, "I went shopping in my own neglected studio stash and found this gorgeous floral flocked paper from Little Yellow Bicycle. 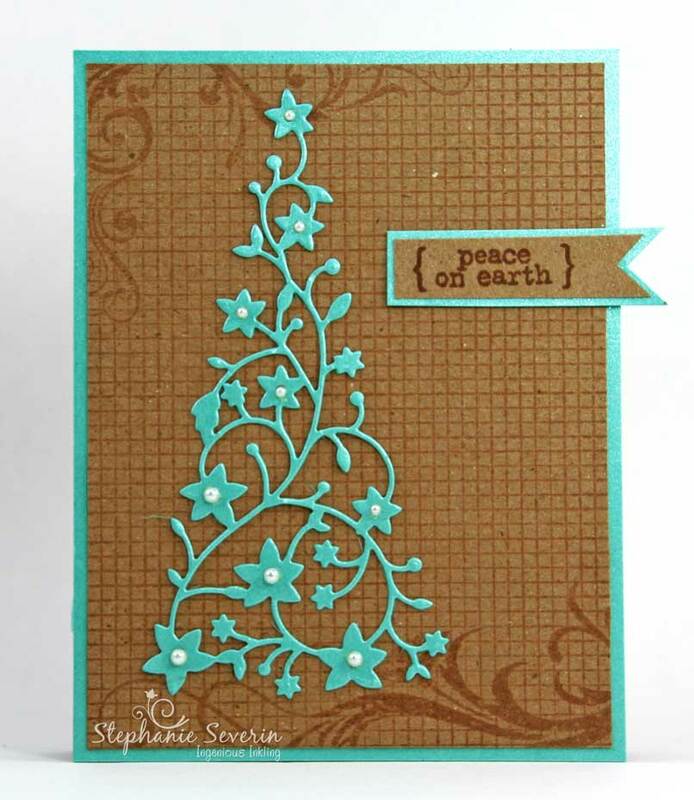 While I don't normally think of flowers for a Christmas card, I think the soft subtle grey-on-grey pattern works well as a background element. 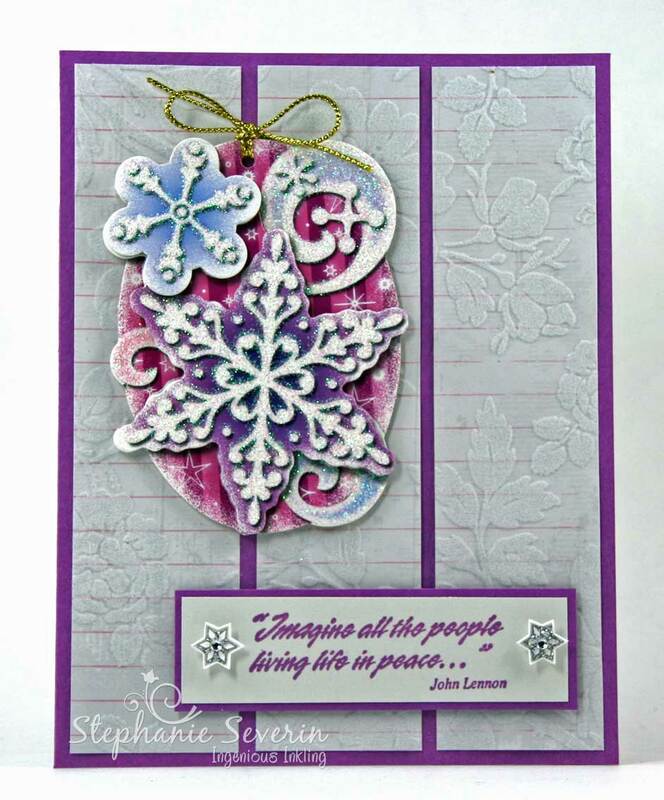 I added one of the many dimensional gift tags I picked-up on clearance after the holiday last year & one of my favorite peace quotes to finish the design." 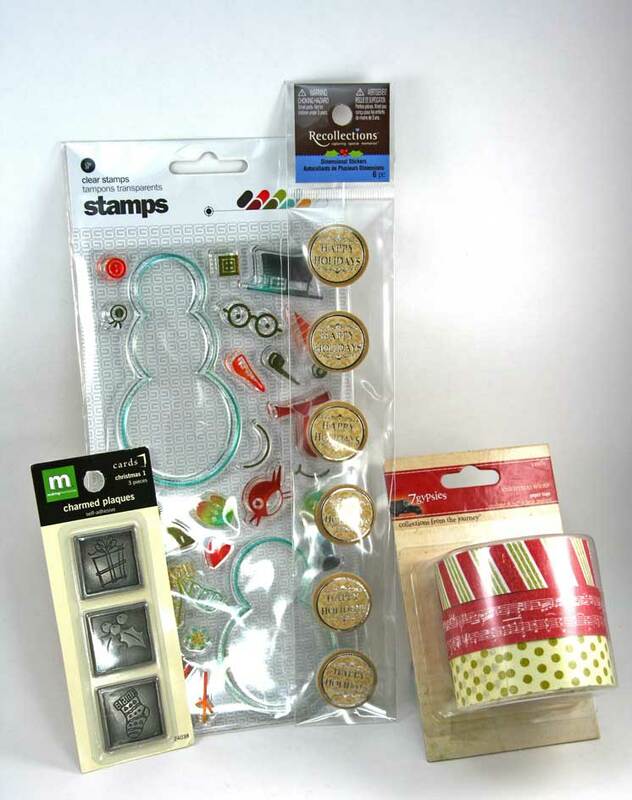 For a little extra fun, we're throwing in some holiday goodies for one lucky participant (drawn at random from all sketch cards linked-up) ... goodies include a Basic Grey Jovial build your own snowman stamp set, 7Gypsies Christmas Wrap paper tape, some Making Memories Charmed Plaques and some Happy Holidays dimensional stickers. 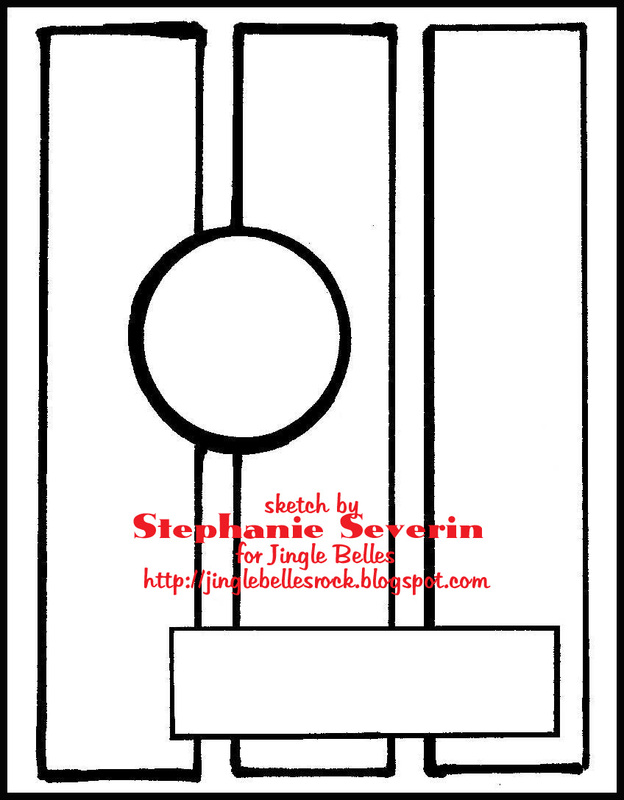 and now it's time to see what you will do with stephanie's fabulous sketch: dress it up or down, make it classic or non-traditional, embrace "clean and simple" or go for the gold and pile on the goodies! whatever you choose, link it up here before 6pm (EST) on wednesday, august 22nd. keyword for galleries and our flickr group is JB-12-17. We loved seeing all of the characters from the North Pole ... here are a few of our favorites. Liquid Pearls and Stickles to highlight the holly berries. 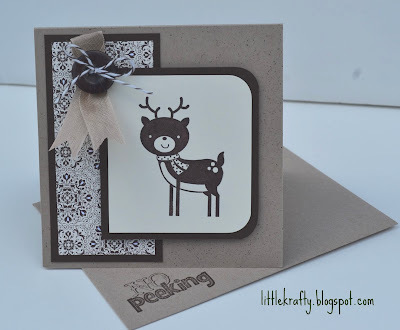 rocked the monochromatic color palette with this adorable reindeer. 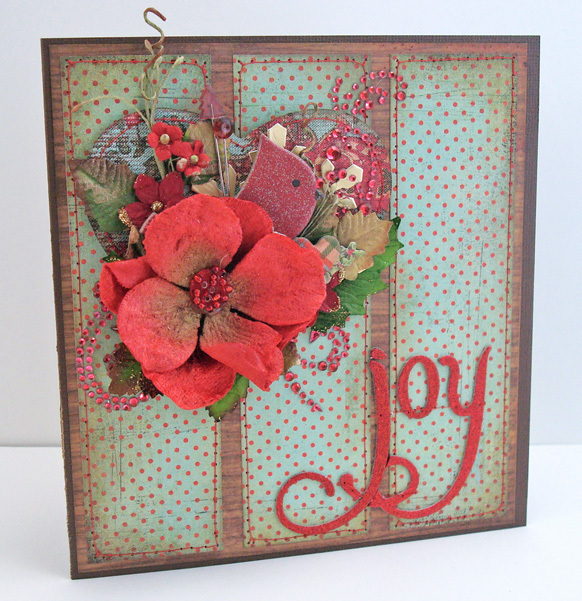 with lots of fabulous stamping details. letters to Santa mailed each year. 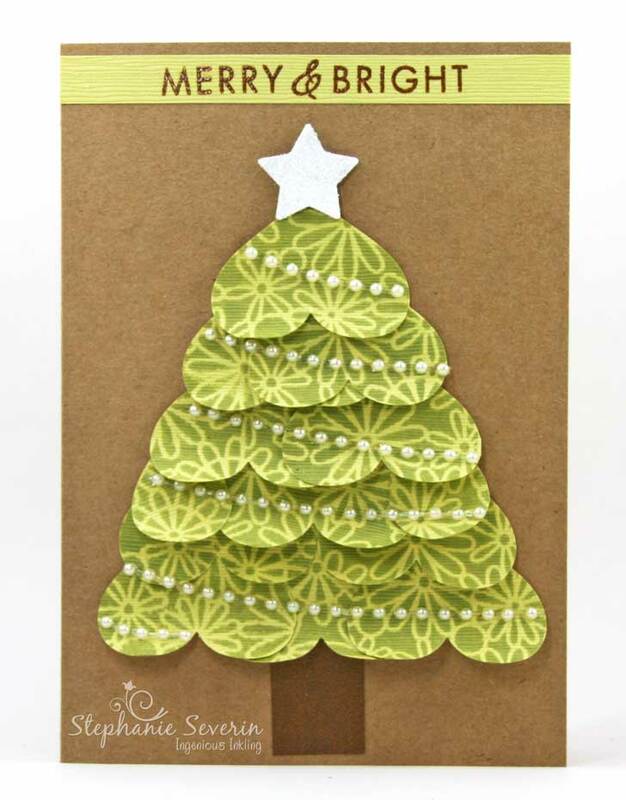 Come back at midnight tonight for another fun Jingle Belles prompt ... as we keep taking back Christmas one holiday card at a time. 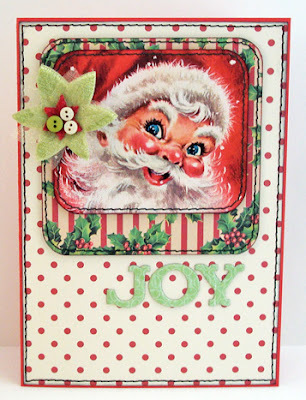 We're back at the North Pole this week with our Santa Baby prompt ... creating cards featuring Santa, Mrs. Claus, Elves, Reindeer ... anyone you might find at Santa's North Pole home. Lauren says, "i think by now everyone pretty much knows that i ♥LOVE♥ vintage papercrafting ingredients, whether they be "the real thing" like this santa i clipped from an old christmas card, or new product that's designed with a retro vibe like these jenni bowlin papers. 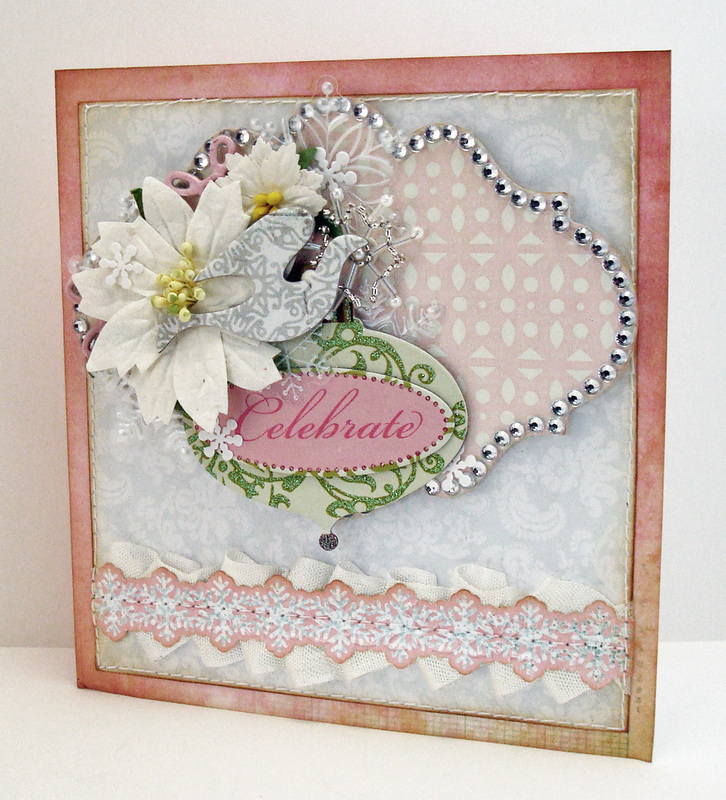 something else i love is a really great sketch--this card was inspired by unscripted sketch #169 and it could not possibly have been easier or more fun to put together!" with a vibrant pink paper-pieced reindeer with touches of silver glitter. 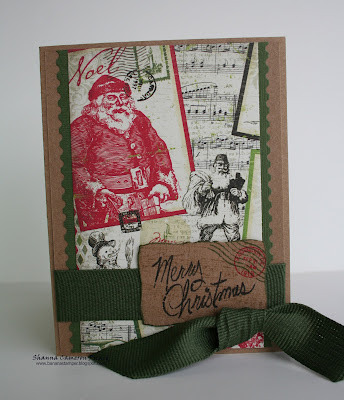 with Echo Park Holly Jolly Christmas papers." Remember, you have until 6pm (EST) on Wednesday, August 8th to link-up your Santa Baby creation. barry snarr... the prince of paper! our merry band of fabulous followers! would you like a badge? lela meinke aka "serenity stamper"
marie bingaman of ANOTHER card making blog? lisa j. of stamping, crafting and snow, oh my! 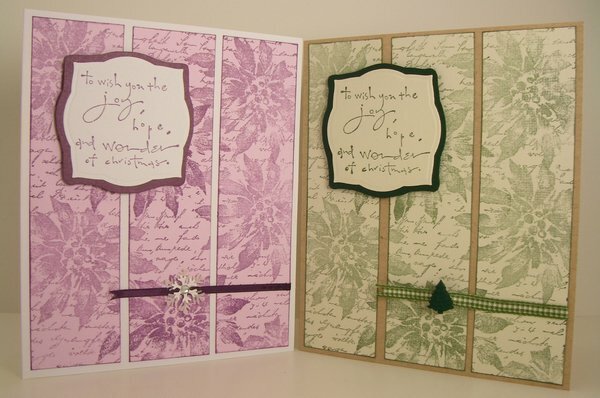 leslie of the crooked stamper... x2! marie bingaman of another card making blog? !